And so we begin this post on decisions and directions with the Chariot. Take a look at this book. The Charioteer or central figure of the trump wears a crown and overhead is a canopy of stars. He also wears armor. The Charioteer’s feet are in his Chariot, only the wheels of the Chariot touch the ground. All of these symbols speak of the driver being protected (armor) and prepared (stars as right timing). The scepter in his right hand speaks of his control or his will. In some TdM decks the Charioteer holds a sword in his left hand. The esoteric lore of the seventh Trump card identifies the Charioteer with Hermes and the Chariot itself as the Hermetic tradition. The trump says GO STRAIGHT, do not deviate as the horses – our natural impulses would. The driver is there IN THE CENTER to maintain control and keep the Chariot on course and moving in a forward motion. 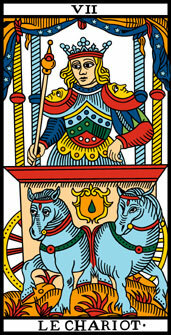 The Chariot is both like and unlike the card which precedes it, The Lovers. The Chariot is the solution to the scenario depicted on the Lovers card. 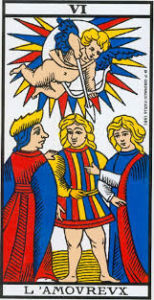 In Tarot, The Lovers trump shows a situation of selection. It is where the Querent is at – if the card is in a flagged position in a spread or in the center in a line of cards. The Lovers is graphically the same as the Chariot with some differences. In the Lover’s card shown just below from the Grimaud TdM, the central figure is barefoot. His legs are without hose under his doublet. His outfit is worse than that of the Fool! His empty hands are held close to his body and limited in motion by the proximity of two women. In trump six the women take on the role of the chariot horses by coding the different “turnoffs” or directions i.e. right or left which the central character, the Querent is being pulled in. There is an older Latin name for the sixth trump which is Bifurcatio, a fork in the road or a divide. If the central figure corresponds to the Chariot in the Lovers card then who is the Charioteer? It is the cherub above who plays that role in the Lovers card. It is Cupid’s Arrow or the attractive force which will prompt the selection and the direction taken by the central figure. While in The Chariot trump the scepter is held by the Driver, in the Lovers the arrow is not in the central character’s hands but is aimed at him from above! This means the decision is literally “out of his hands”. What the central figure is calling decision or choice is actually a selection based on factors which he or she does not control coming down from a higher source. The term higher source can refer to the celestial hierarchies or star laws which operate literally over the heads of mankind compelling them in their season to act, as does every species of flora and fauna on the planet. There is an additional implied third direction at the Lover’s fork in the road. It is the backward direction, the psychological equivalent of backsliding on regrets and doubts which first show up as being hesitant to select. While the time of making a “selection” appears to be in the present moment, prolonging the decision places a client in limbo. Limbo being the recurring or replaying of the present moment in linear time, the eternal return as a feedback loop in the mind which traps the client. As selection is somewhat pre-conditioned in the Lovers by so many factors NOT IN THE CLIENT’S HANDS, it often manifests as being different in external appearance but of the exact same essence or energy configuration! In seeing a group of cards when a Querent is asking about an impending important decision The Lovers card alone offers no solution. Look to see if the Chariot is included in the grouping for it will indicate the Querent who is willing and ready to make a choice which puts them on the straight road out of Dodge or Oz. Remember, pip cards hold the energies of the first ten Major Arcana and their suits indicate the four different stages of the invisible abstract descending into visible manifestation. 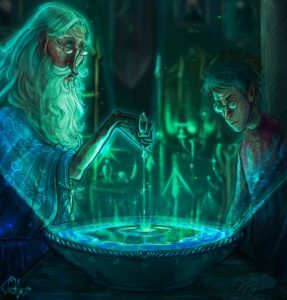 Wands represent the energetic state; Swords – thoughts, a mental frequency rate; Cups the psycho-emotional “feelings” of attraction and repulsion and finally Disks which are symbolic of energy vortices* in the subtle bodies of mankind and the planet. The presence of any grouping of 3 or more 6’s or 7’s in a reading foreshadows an approach of either a Lovers – Chariot situation for a Querent. Note: *Vortex-1650s, “whirlpool, eddying mass,” from Latin vortex, variant of vertex “an eddy of water, wind, or flame; whirlpool; whirlwind,” from stem of vertere “to turn” (see versus). Plural form is vortices.